That is going to look amazing! Love how it's all coming together! Wow! I love it! It totally transformed your kitchen. Beautiful. Looks awesome, Shelli!! The Kashmir White is going to look amazing! Love a honed finish. Can't wait to see the finished product! Love the transformation, Shelli! Looking forward to see the finished product! P/S: Come by and enter my fun giveaway if you like! Oooh looks fantastic!! Did K loooove Disney?? We have that same granite in our kitchen! 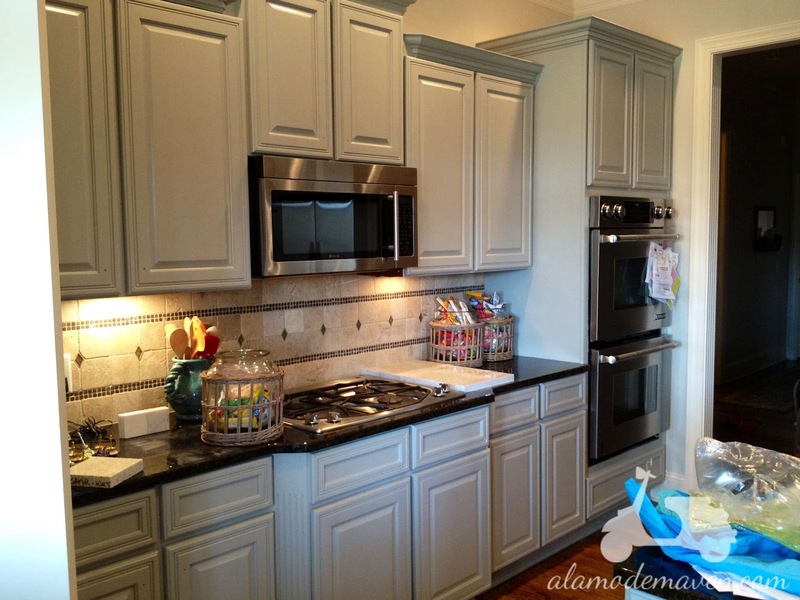 I love it with your cabinets...this room is going to be stun-ning! 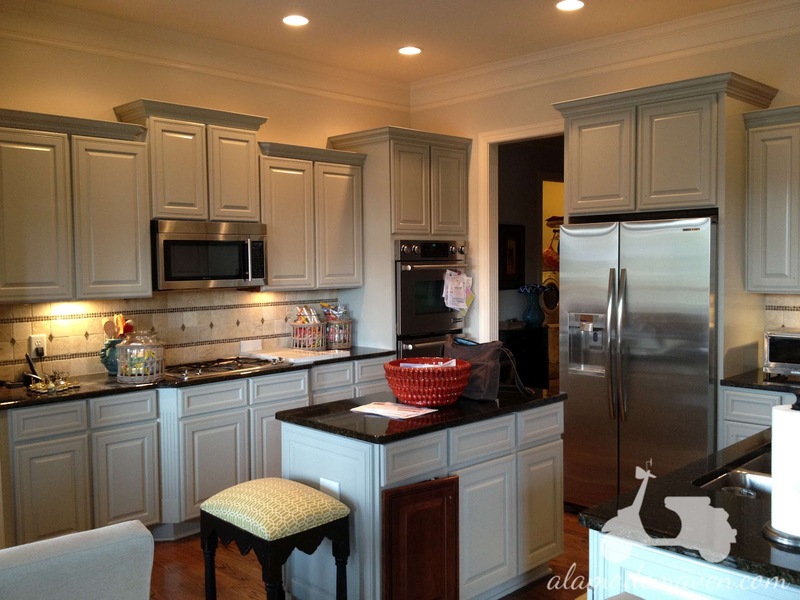 I have honed Kashmir White in my kitchen and I absolutely love it. One point of caution, though...you must be religious about sealing it with a top quality sealer, and one time won't cut it. Another thing...pay attention to what you leave on the countertops. For example, I recently bought a couple of pints of strawberries. Hadn't had them on the countertop for more than an hour. By the time I was ready to put them away, a rogue strawberry had leaked juiced into my granite. The size of four pints! 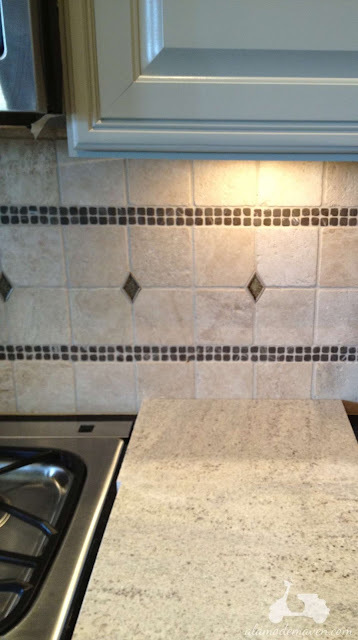 As long as you know your stains, you can make a poltice to pull the stain out -- but it's VERY important with Kashmir White (and similar light granites) to attend to it immediately. For instance, strawberry juice required me to go to the beauty supply store and buy 12% hydrogen peroxide and then Lowes for some plaster of paris to make a poltice. Every speck of juice was pulled out by the next morning. Then, on another day, my olive oil bottle left a ring. I needed acetone and plaster of paris for that poltice. Again, every speck pulled out. Just make sure you know your stains and familiarize yourself with this website: www.columbusgraniteandmarble.com/news/2/59/911-to-Stain-Removal-for-Your-Natural-Stone in the meantime. It's a great resource for granite stain removal and I've never used one of their methods and failed; all successful. Kashmir White takes a lot of work to keep it looking beautiful, especially if you do a lot of cooking, baking and entertaining like us. But it is so gorgeous, you'll find the extra diligence is worth it. Good luck! It is going to look gorgeous Shelli! We have honed as well and absolutely love it. You must be so happy with how your kitchen is coming along. Looks like you are in the home stretch. Have a great weekend! Wow, looking amazing and the kitchen New Port Richey painting company looks huge? Did you buy two and combine them?